Welcome to Saturday Sweets! 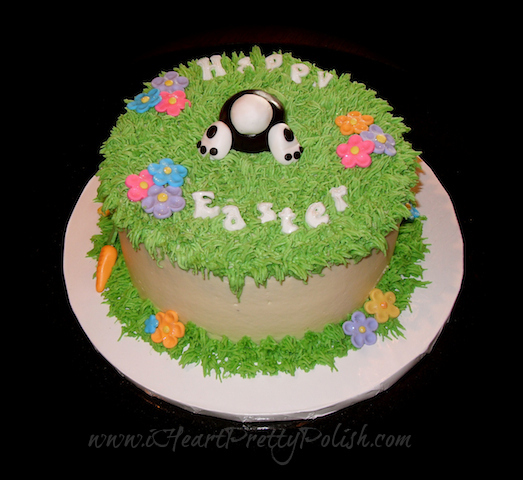 This is an Easter cake I made a few years ago for a family Easter Dinner. This is a chocolate cake with buttercream icing and fondant accents. Now....I will give you 2 guesses as to what the brown and white thing is in the middle. I will give you some hints. It's not a panda (as someone in my family guessed...won't name any names) and it's not a turtle (as someone else in my family guessed). It has a little something to do with Easter. I guess maybe my fondant molding skills weren't exactly up to par because it wasn't as obvious at Easter as I had planned. I hope maybe this gives you a little inspiration for an Easter dessert. It was very easy to make. Everything you would need is found at Michaels Craft Store - or most other craft stores with a cake decorating section. 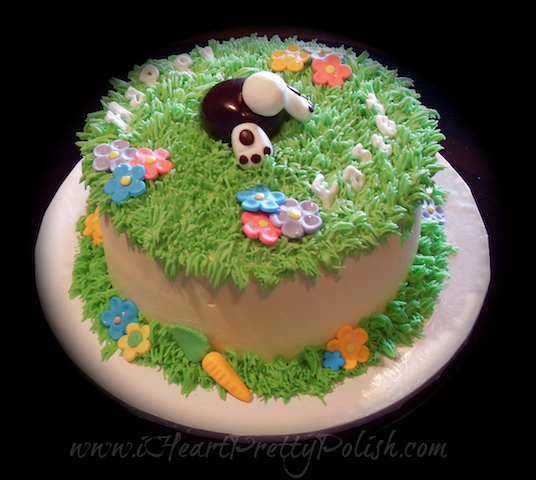 The grass is made with a grass tip and you can find the fondant cutters for the flowers, carrot, bunny, and letters there as well. I buy my fondant at Global Sugar Arts (it's Satin Ice and it tastes like marshmallows - and it's pre-colored). But if you don't want to order it online, Michaels has fondant too, it just doesn't taste as good. Well you should try using some fondant. Maybe purchase just a small tub from Global Sugar Art and get some little flower cutters to start out with. It's really easy and adds a lot to a cake or cupcake. Thanks for the compliment. That's a little bunny digging in the ground! I absolutely ADORE this cake ♥. Yep, you got it:) Thanks! Cute! I really want to take cake decorating classes. You should! I learned from the classes at Michaels. You learn tons just from the first few classes. It's worth it and fun! The cake is adorable! I love it. The bunny is perfect. :) Thanks so much for commenting! This is so darn cute - well done! How adorable is this! It looks so good, but I don't know if I could eat it! Thanks for sharing!